Gayle over at The Grocery Cart Challenge posted about a cookbook from a 91 year old woman named Clara who grew up in the depression. I have seen some of her recipes on Youtube and this is now one of my family's favorites. If you get a chance, check out her book. It's full of great frugal recipes as well as some frugal living skills of her own. Wash potatoes and dice. Leave skin on for extra nutrition. Chop onion. Slowly brown onion and potatoes in a large skillet onver med heat. Meanwhile slice hot dogs. Add tomato sauce to potatoes and stir to mix. Add hot dogs. Cook till potatoes are done. You can add a little water to help cook the potatoes and make it kind of saucy. Since the rest of the meal is so cheap you can really stock this salad. I like tomatoes, shredded carrot, zuchinni and chopped broccoli. You can add whatever your family likes. Bethany is my second cousin (who I didn't send a valentine to. Now I think I should) who put a great post on her site about a spaghetti dinner being only $4.70. I guess CBS thought that you could do it for a measly $35. Hello people! Her entire dinner is under $5 and sounds quite delish. So, for my Family Meals under $5 I am reposting her dinner for you to enjoy. I love seeing what others can do as well. If you have a family meal under $5 we'd love to hear about it. Today only Feb 12th, get a free 8x10 collage print when you order online! Just enter code VDAY at checkout. I think these photo collages are so cute that I just had to do one up so I could show you. It's super easy to do and doesn't take a lot of time, depending on how easily you can decide on your pictures. You can have a few pictures or a lot. I think they'll let you go up to 20. You can add a caption, which I did when using it as a card, or just leave it blank. One cute idea is to have the people in the photos hold a sign like "thinking of you" or "Happy Valentines Day". Right now they're having a sale on all their collages through Saturday Feb 13. Enter code FEB30 at checkout and get 30% off. That equals $1.39 for a 5x7 collage. You can't beat that!!! Of all the holidays we celebrate there is one that I'm starting to not like. Valentines Day. It's not that I don't like this holiday, I just don't like the fact that it seems to be less about love and more about commercialism. For starters why do things like flowers suddenly have to double in price just because people want to express their feelings for one another? And why do I have to send a valentine to my second cousins? I thought Valentines Day was for lovers. Well, I am not without a solution. First of all, I used to tell my husband not to buy me flowers on Valentines Day. I have since changed that because I love fresh flowers and I discovered that Costco has beautiful boquets for a reasonable price that is constant pretty much the whole year through. I also just saw in the Wal-Mart circular that a dozen roses are only $15. Not too bad. Second are the paper Valentine cards the kids exchange at school. I put a dollar limit on these. And I do mean $1. I refuse to pay $4 a box (x 2) for something kids are going to open, look at, then throw away. My favorite place to find these little cards is at the thrift stores. They often have popular themed cards for 25c - 75 c a box. Another good time to buy them is the day after Valentines when everything is 50% off and save them for next year. An even better idea is to have the kids and you for that matter, make your own Valentine cards. There are lots of great sites out there with cute ideas like AllFreeCrafts.com. I especially like the post Valentines Day on a Dime found here. They have lots of cute ideas that I've done myself. This year I've decided to do some collage cards. I love these! 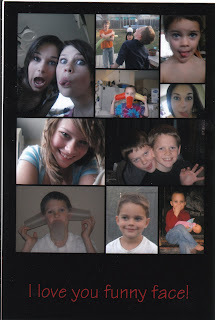 I go through Walgreens Photo and it only cost me 31c for a super cute 4x6 collage photo that I'm using as a card. Remember, the best gifts really are the ones from the heart. Sorry to give you a mexican dish 2 weeks in a row but there were a lot of things on sale this week for the Super Bowl so it just worked out that way. I know you'll enjoy it anyway. This recipe comes from my tried and true church cookbook. Thanks Melanie for a great recipe. Crush chips on the bottom of a greased 2qt casserole dish. Brown ground beef with onion and garlic. Add spices, chili and tomato sauce. Stir to combine. Place on top of chips and top with cheese. Bake at 350 for 20-30 min or until heated through. I would serve this with lettuce, sour cream and tomatoes. I'd only do the tomatoes if you could get them at a good price which seems difficult these days. If not just leave them out. I can't wait for summer and fresh tomatoes from the garden!